Now Streaming: Is “Mrs. Maisel” Marvelous? Posted by Theresa March 21, 2017 11:40 a.m. There was no question that I would watch “The Marvelous Mrs. Maisel” pilot on Amazon Prime. An hour-long dramedy created by Amy Sherman-Palladino featuring a brassy female protagonist? Sold. Oh, and it’s set in New York in the late 1950s, scratching that “Mad Men” itch I’ve had for two years? Double sold. But after the ups and downs of Netflix’s revival of “Gilmore Girls” last fall (that musical, the fat jokes, Rory in general, etc. ), I did have some reservations. ASP (and her creative partner and husband Daniel Palladino) sometimes mistake quirk for personality, and are rather tone deaf to sensitive identity issues. The period setting, though, helps alleviate some of Palladinos’ weaknesses. They may try to get by some political incorrectness with the lame excuse that “It’s the 1950s!” And their Achilles’ heel – critical commentary on the developments of modern technology verging on Luddism – is no more advanced than a scene with an electric pencil sharpener and a befuddled secretary. Plus, those costumes, those hairstyles, those settings … it’s a visual delight for lovers of mid-century modern décor and Spoolie hair rollers. “Mrs. Maisel” is Midge, an Upper West Side, twenty-something housewife and mother who supports her nine-to-five husband Joel in his late night attempts at stand-up comedy in Greenwich Village. Local viewers are in for a treat(?) 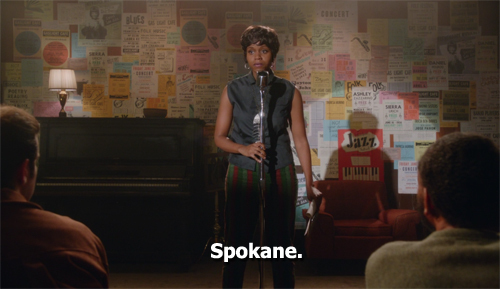 when, prior to Joel’s set at the Gaslight Café, a dour Beat poet recites an ode to her hometown (“rumble of lumber trucks … robbers of the indigenous … Spokane … man.”). Rachel Brosnahan plays the title role with strength and impeccable timing. 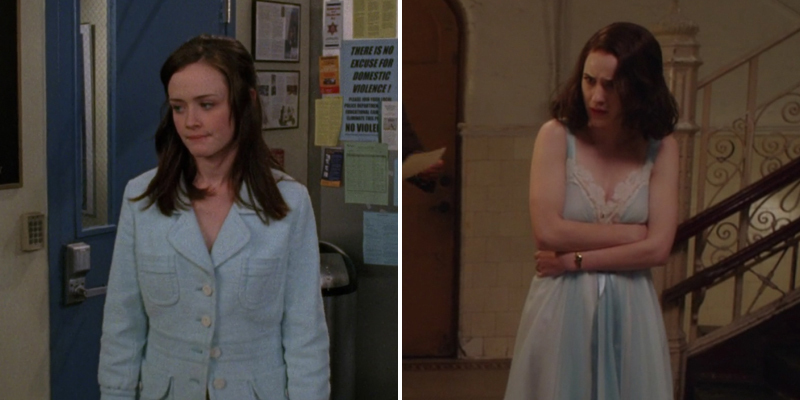 She has the wit and charisma that Alexis Bledel always seemed to lack as Rory Gilmore. The comparison between the two characters isn’t hard to make, right down to the dual image of the pretty waifs with mussed, brown hair being bailed out of jail in powder blue. But while Rory succumbed to her setbacks, Midge confronts them – with encouragement from ASP mainstay Alex Borstein. “The Marvelous Mrs. Maisel” is part of Amazon Prime’s original pilot season, which means viewers must vote for their favorite shows before they’re picked up to series. Given ASP’s legacy and enthusiastic fanbase, I look forward to seeing more of Midge’s misadventures in Manhattan in the future.